Coffee shops in bookshops and tearooms in department stores have long been commonplace. Restaurants have also often sold the art displayed on their walls, and delis have been popular extensions. 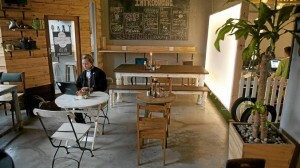 But restaurants in apparel shops seem to be a new phenomenon in Cape Town. For several years now, the Loading Bay in De Waterkant has been attached to a shop selling exclusive garment brands such as Our Legacy, Acne and Velour. More recently an Australian-inspired surf lifestyle shop, Latitude 33, opened on Bree Street with a casual restaurant downstairs (breakfasts, salads, sandwiches), but selling board shorts, Cobian flip-flops and Electric Visual sunglasses upstairs. The Beleza Restaurant and Bar in Kloof Nek contains a boutique selling “vintage” clothing, also known as “pre-loved” or, in plain speech, second-hand clothes. But the concept of integrating retail and a restaurant has been taken to a new level by the innovative It’s a House, which opened in late 2012. A number of spaces for hire surround a comfortable central lounge and bar. These can be used as offices, retail space (including for clothing) or galleries. Leasing is short term and constantly turning over. As the proprietors put it, it is a “space that promotes interaction, collaboration and offers comfort in a home-type ambience where creativity and imagination can breed with ease”. It’s about “a bespoke lifestyle”, and the word creative is somewhat bandied about. I recently saw myself listed on an event programme as “Brent Meersman (creative)”. Under apartheid, one was listed — along with dancers, poets and musicians — on such programmes as “cultural item”. It’s a House is aimed at all those who fall in the category covered by the ghastly new term “creatives” — film, fashion, music, design, art, etcetera. Although this may sound a bit flimsy, the space works well. There is always something new to see. And, for funky décor, it is unusually practical. The vibe is cool, laid-back and very welcoming. For merely arriving by bicycle, I was eligible for a free coffee in the style of my choice. You quickly feel that you belong and that the intentions of the establishment are honourable. The place has monthly pop-up markets for designers and collectors and is geared for private functions and film screenings. In June, it hosted one of the screens for the Shnit international short films festival. The restaurant, which also has a few car-tyre swings for seats, serves fresh juices and makes tasty apple-based combinations with a predilection for ginger, including spinach and celery (a Popeye), pineapples and orange (a Shnappel), or beetroot and carrots (Da Root). Breakfasts are served all day, with the usual English options, including soldiers (strips of toast dipped in a soft-boiled egg). My favourite is with creamy mushrooms and a creative pine-nut sauce. The menu is on blackboards and does change. The kitchen keeps a stock of cold meat, such as parma ham, Black Forest ham and pastrami, which you can choose from for a sandwich that is served on a wooden board with a small side salad and a baked potato wedge. One sandwich is oddly named The Jew, and has rocket, tomato, Danish feta, fried brinjal and peppadews — with a choice of ham! It was tasty but not kosher. Other tantalising combinations are coppa (an Italian cut of pork taken from the neck) with fig preserve, pecorino and spinach, or the classic New Yorker with pastrami, wild rocket, gherkin, cream cheese, tomato and Dijon mustard. There is a tempting range of salads that goes beyond the usual green or Greek, such as prosciutto and melon; butternut, feta, rocket and pumpkin seeds; and Asian beef with stir-fried veggies. More substantial meals include burgers with the usual popular add-ons. Monday night is burger night special with two burgers and two Craft beers for R145. It’s a House is a conducive place to hang out and chill. And with free wi-fi, this is a good spot for “creatives” to get, well, creative. It’s a House, 20 Jarvis Street, De Waterkant. Open Mondays to Saturdays from 8am to midnight. Phone 021 418 2411. This article first appeared in the Mail & Guardian 28 June 2013.